Plans for a motorway lorry park to relieve congestion when there are delays at Channel ports have been announced by Kent County Council. The proposed 50-hectare site between Aldington and Sellindge in Kent would have space for up to 3,000 lorries when Operation Stack is in force. 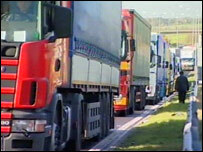 Vehicles currently park on the M20 when cross-Channel transport is blocked. Critics said it would be dangerous to park so many lorries near the National Grid converter station at Sellindge. The flood-lit park, which would also offer rest facilities throughout the year for up to 500 lorry drivers, would be located between Church Lane and Station Road, between junctions 10 and 11 on the M20. Councillor Peter Wood, who represents the Saxon Shore ward for Ashford Borough Council, accused Kent County Council of "not thinking strategically" or considering the environmental impact properly. He said: "Adequate consideration has not been given to siting hundreds, and indeed thousands, of potentially explosive fuel tanks in such close proximity to a facility of strategic national importance." The National Grid station, which converts electricity imported from France, is too close to the site, he said. "We believe that Kent County Council has taken the softest option possible, seeking to minimise opposition by selecting an area considered by them as peripheral to both Ashford and Shepway," Mr Wood added. Operation Stack has been in force for most of the last eight days because of on-going industrial action by SeaFrance workers in France and bad weather, the longest use since its launch 20 years ago. Councillor Paul Carter, leader of Kent County Council, said: "We've come up with the solution that would have held virtually every lorry that has been held up in the last 11 to 12 days in a compound very close to the M20 motorway." Assistant Chief Constable Allyn Thomas of Kent Police said: "We are very frustrated with the way that we have to put stack on as a last resort. It is very labour intensive for us and clearly causes huge concern in the county. "We think the lorry park offers a permanent solution to the problem of the stack in the coming years." The council will apply for planning permission for the site and for funding from the Department for Transport.